The Kirkland Police Department said officers acted in accordance with "departmental norms" and did not act out of racial bias. The department has created a new protocol for "unwanted person" calls. 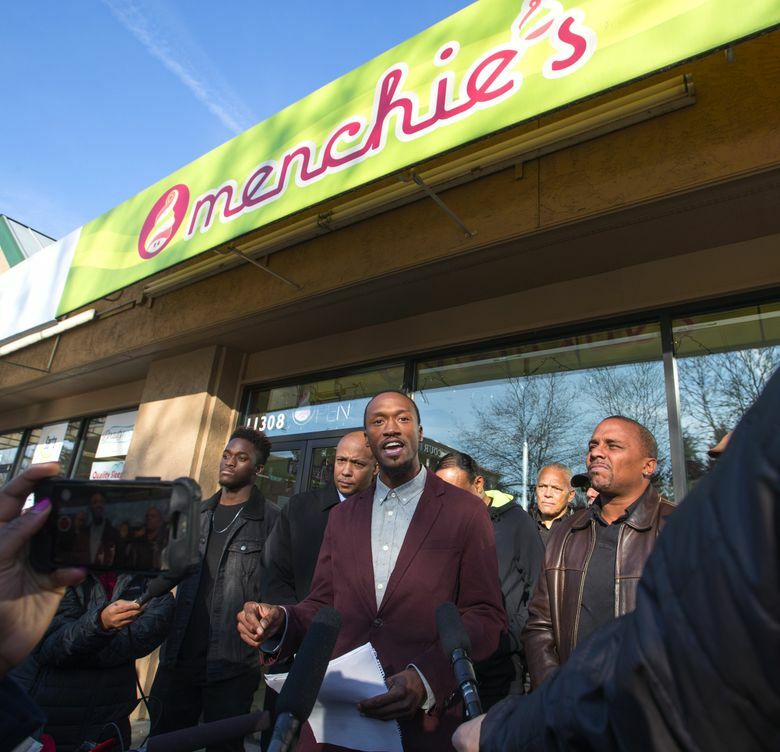 Kirkland police officers did not violate internal policy when they helped the owner of a frozen-yogurt shop expel a black man from the store in November, the city’s police department has ruled. Still, the department says it has a new protocol for officers responding to such calls. Byron Ragland, 31, was at a Kirkland Menchie’s in November overseeing an outing between a mother and son as part of his work as a court-appointed special advocate and visitation supervisor. The store owner called 911 to report that his employees felt “scared” because Ragland was sitting in the shop but had not bought anything. Police arrived, requested his personal information and told him the owner wanted him to leave. Ragland left. The incident was first reported in a Seattle Times column and sparked widespread condemnation, including from the Seattle King County NAACP. The Kirkland Police Department apologized and promised an internal investigation. The city also said its employees would undergo implicit bias training. In a statement Friday, the department said officers handled the call in accordance with “departmental norms” and did not act out of racial bias. However, officers “missed the opportunity to mediate between the employees and Mr. Ragland,” the department said. The department also announced it has implemented a new protocol for so-called “unwanted persons” calls, instructing officers to encourage business owners and employees to communicate why someone is being asked to leave and attempt to mediate conversations between the business and person being asked to leave. In an interview as part of the internal investigation, the woman whose visit with her son was being supervised by Ragland said she told the officers who responded that Ragland was with her supervising her visit. Police still demanded Ragland’s ID, she said. Kirkland police tried to contact Ragland but he did not participate in the investigation, according to the report. Reached by phone Friday, Ragland did not immediately have a response to the department report. Both officers who responded acknowledged they were told Ragland was there to supervise a parental visit, according to statements included in the report. One of the officers, Patrol Corporal Michael De Aguiar, said Ragland asked if he was being told to leave because he is black and that the mother and two other customers said what was happening was wrong. De Aguiar later informed a sergeant about the incident, saying it may spur a citizen’s complaint. In an interview for the investigation, the store owner, Ramon Cruz, said that after several recent incidents at his various businesses, including a robbery involving a gun at a different store, he instructed employees to call the police if something or someone made them uncomfortable, according to a summary of the investigation. Cruz called police on Ragland “out of an abundance of caution,” the report said. An employee who was working at the time texted Cruz’s wife about a “weird guy” sitting at a table with his head down without buying anything. The employee, whose name is redacted in the report, told police later she and a co-worker were not scared, but just being cautious, according to the report. An officer told her something like, “This is Kirkland and we just kicked a black man out of the store. People are gonna see this as something of racism,” the employee said. Kirkland police responded to 674 “unwanted subject” calls in 2018 through Nov. 27, according to the report. Of the 855 people who were subjects of those calls, 13 percent were black. Just 1.2 percent of Kirkland’s population is black, according to census data. A “Culture of Accountability Report” from the 911 agency NORCOM found the 911 call-taker “did not act of racial bias” and followed standard procedures. NORCOM said it would provide more training to employees on unwanted subject and trespass calls.